The origin of the Hand Salute is uncertain. Some historians believe it began in late Roman times when assassinations were common. A citizen who wanted to see a public official had to approach with his right hand raised to show that he did not hold a weapon. Knights in armor raised visors with the right hand when meeting a comrade. This practice gradually became a way of showing respect and, in early American history, sometimes involved removing the hat. By 1820, the motion was modified to touching the hat, and since then it has become the Hand Salute used today. In British history, in the early 1800s, the Coldstream Guards amended the British military salute custom of tipping the hat. They were instructed to clap their hands to their hats and bow as they pass by. This was quickly adopted by other Regiments as wear and tear on the hats by constant removal and replacing was a matter of great concern. By the mid 19th Century, the salute had evolved further with the open hand, palm to the front, and this has remained the case since then. Most historians believe, however, that the U.S. Military salute was influenced more by the British Navy. The Naval salute differs from the "Open Hand" British Army Salute in that the palm of the hand faces down towards the shoulder. This dates back to the days of sailing ships when tar and pitch were used to seal the timber from seawater. To protect their hands, officers wore white gloves, and it was considered most undignified to present a dirty palm in the salute, so the hand was turned through 90 degrees. The salute is a courteous exchange of greetings, with the junior member always saluting first. When returning or rendering an individual salute, the head and eyes are turned toward the Colors or person saluted. When in ranks, the position of attention is maintained unless otherwise directed. Military personnel in uniform are required to salute when they meet and recognize persons entitled (by grade) to a salute except when it is inappropriate or impractical (in public conveyances such as planes and buses, in public places such as inside theaters, or when driving a vehicle). When the United States National Anthem, "To the Color," "Hail to the Chief," or foreign national anthems are played. To uncased National Color outdoors. On ceremonial occasions (such as Change of Command, and Military Parades). At reveille and retreat ceremonies, during the raising or lowering of the flag. During the sounding of honors. When the Pledge of Allegiance to the U.S. flag is being recited outdoors. When turning over control of formations. Indoors, except when reporting to an officer or when on duty as a guard. Prisoners whose sentences include punitive discharges have lost the right to salute. All other prisoners, regardless of custody or grade, render the prescribed salute except when under armed guard. When reporting to an officer in his office, the military member removes his headgear, knocks, and enters when told to do so. He approaches within two steps of the officer’s desk, halts, salutes, and reports, "Sir (Ma’am), Private Jones reports." The salute is held until the report is completed and the salute has been returned by the officer. When the business is completed, the member salutes, holds the salute until it has been returned, executes the appropriate facing movement, and departs. When reporting indoors under arms, the procedure is the same except that the headgear is not removed and the member renders the salute prescribed for the weapon with which he is armed. The expression "under arms" means carrying a weapon in your hands, by a sling, or a holster. When reporting to a noncommissioned officer, the procedures are the same, except no salutes are exchanged. When reporting outdoors, the military member moves rapidly toward the officer, halts approximately three steps from the officer, salutes, and reports (as when indoors). When the member is dismissed by the officer, salutes are again exchanged. If under arms, the member carries the weapon in the manner prescribed for saluting. The practice of saluting officers in official vehicles (recognized individually by grade or identifying vehicle plates and or flags) is considered an appropriate courtesy. Salutes are not required to be rendered by or to personnel who are driving or riding in privately owned vehicles except by gate guards, who render salutes to recognized officers in all vehicles unless their duties make the salute impractical. When military personnel are drivers of a moving vehicle, they do not initiate a salute. In Formation. Individuals in formation do not salute or return salutes except at the command Present, ARMS. The individual in charge salutes and acknowledges salutes for the entire formation. Commanders of organizations or detachments that are not a part of a larger formation salute officers of higher grade by bringing the organization or detachment to attention before saluting. When in the field under battle or simulated battle conditions, the organization or detachment is not brought to attention. An individual in formation, at ease or at rest, comes to attention when addressed by an officer. Not in Formation. On the approach of an officer, a group of individuals not in formation is called to "Attention" by the first person noticing the officer, and all come sharply to Attention and salute. This action is to be taken at approximately 6 paces away from the officer, or the closest point of approach. Individuals participating in games, and members of work details, do not salute. The individual in charge of a work detail, if not actively engaged, salutes and acknowledges Salutes for the entire detail. A unit resting alongside a road does not come to Attention upon the approach of an officer; however, if the officer addresses an individual (or group), the individual (or group) comes to Attention and remains at Attention (unless otherwise ordered) until the termination of the conversation, at which time the individual (or group) salutes the officer. Outdoors. 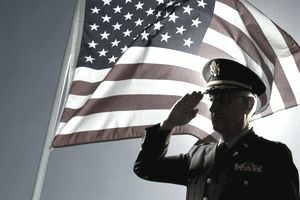 Whenever and wherever the United States National Anthem, "To the Color," "Reveille," or "Hail to the Chief’ is played, at the first note, all dismounted personnel in uniform and not in formation face the flag (or the music, if the flag is not in view), stand at Attention, and render the prescribed Salute. The position of Salute is held until the last note of the music is sounded. Military personnel not in uniform will stand at Attention (remove headdress, if any, with the right hand), and place the right hand over the heart. Vehicles in motion are brought to a Halt. Persons riding in a passenger car or on a motorcycle dismount and salute. Occupants of other types of military vehicles and buses remain in the vehicle and sit at attention; the individual in charge of each vehicle dismounts and renders the Hand Salute. Tank and armored car commanders salute from the vehicle. Indoors. When the National Anthem is played indoors, officers and enlisted personnel stand at Attention and face the music, or the flag if one is present. National and organizational flags, which are mounted on flagstaffs equipped with finials, are called Colors. Military personnel passing a military formation in which an uncased National Color is being carried, salute at six steps distance and hold the Salute until they have passed six steps beyond it. Similarly, when the uncased Color passes by, they salute when it is six steps away and hold the Salute until it has passed six steps beyond them. NOTE: Small flags carried by individuals, such as those carried by civilian spectators at a parade, are not saluted. It is improper to salute with any object in the right hand or with a cigarette, cigar, or pipe in the mouth. Seated as a member of (or in attendance on) a court or board. Entering places of divine worship. In attendance at an official reception. Personnel remove their headdress indoors. When outdoors, military headdress is never removed, or raised as a form of salutation. When appropriate, civilians may be saluted in lieu of removing the headdress. When military personnel (of any service) board U.S. Navy ships, either as an individual or as a unit leader, they salute according to naval procedures. When boarding a naval ship, upon reaching the top of the gangway, face and salute the national ensign. After completing this salute, salute the officer of the deck who will be standing on the quarter deck at the head of the gangway. The officer of the deck may be a commissioned officer, warrant officer, or petty officer (enlisted). When saluting the officer of the deck, request permission to board, "Sir (or Ma'am), Request permission to come aboard." The officer of the deck will return the salute. When leaving the ship, render the same salutes in reverse order, and request permission to leave, "Sir" (or Ma'am), Request permission to go ashore."